Lock in a great price for Cervo Hotel,Costa Smeralda Resort – rated 8.9 by recent guests! The concierge was very helpful he indicated to us what is the best to do on the island ! ! The private beach was nice and quiet ! Everything came up to and surpassed our expectations: beautifully appointed room, excellent breakfast with lots of choice and nothing too much trouble. Staff were charming especially at breakfast. This hotel is amazing as are the concierge who were so friendly & helpful especially Christian. I have never stayed in such a fabulous hotel & would highly recommend it. Staff is helpful, Especially Christian at the front desk. He saved our holiday with his great recommendations. Lovely luxury hotel, rustic and charming. Staff extremely welcoming and every need attended to. Great pool at the hotel and the tennis club (also with a pool) and gym were a real bonus. I loved the boat ride to the private beach with towels and water provided! Also the free ferry to the new marina around the bay, although it is a scenic walk too. Lovely room with very comfy bed and almost every facility available. The air con was effective and very quiet which is unusual! Great breakfast with lots of choice. 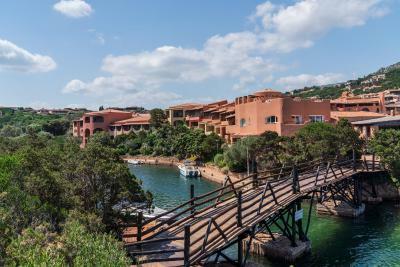 Cervo Hotel,Costa Smeralda Resort This rating is a reflection of how the property compares to the industry standard when it comes to price, facilities and services available. It's based on a self-evaluation by the property. Use this rating to help choose your stay! Rooms are bright, spacious and air conditioned. They feature Sardinian décor, mosaic bathrooms, and wood floors. Cervo Hotel Costa Smeralda Resort offers a wide variety of sports and leisure facilities that are available from May to September, including a tennis court, a gym with outdoor swimming pool, a wellness center and a private beach. Dining at the Costa Smeralda Resort is always different with a range of cuisine, from pizza to Mediterranean specialties. Porto Cervo marina is 10 minutes' drive away and parking is free at the hotel. Nearby you will also find many sport clubs, a shopping promenade and the town's famous nightlife. When would you like to stay at Cervo Hotel,Costa Smeralda Resort? Pink stone and a Moorish Patio for a delightful hotel overlooking the Piazzetta of Porto Cervo, just a few steps from the old pier. Cervo Hotel reflects the spirit of Costa Smeralda: accommodations are charming, airy and bright; the service is impeccable, courteous and attentive. Gather together with your friends and family for a great meal enhanced by stunning views of the beach or bay. The selection of cuisines ranges from Pizza to Mediterranean specialties. Lounge on our private beach or take a dip in one of our pools. Enjoy some live entertainment for a great night out or simply stay in and relax. House Rules Cervo Hotel,Costa Smeralda Resort takes special requests – add in the next step! Cervo Hotel,Costa Smeralda Resort accepts these cards and reserves the right to temporarily hold an amount prior to arrival. Please note that the private beach is open from 25 May 2019. The swimming pool is available from 4 May 2019. Location would have been superb, sadly every shop/restaurant closed as it’s out of season! It was a pleasant stay with family. The only thing that was a negative were the extortionate prices of the food & drink. We are glad they we hired a car as we were able to find less expensive restaurants. We stayed 3 nights but we did not have a chance to see the hotel's private beach. The first day was windy and we learned that they had a technical problem with the boat (which takes guests to the beach). The next two days they could not fix it and the beach was closed. This problem cannot be acceptable for such luxury hotel. They had to find another way to take guests to their beach. Secondly, the hotel's room service and bar are overpriced. In the room, it says the first tea or coffee is free. But we were charged 18 euros for two hot teas in 2 hours after we order. They even don't wait to charge until you check out. If you cannot use the beach and under 45, you should avoid hotels in Porto Cervo area. We were lucky that Christian at the front desk was giving us advices about what to do in neighborhoods nearby.